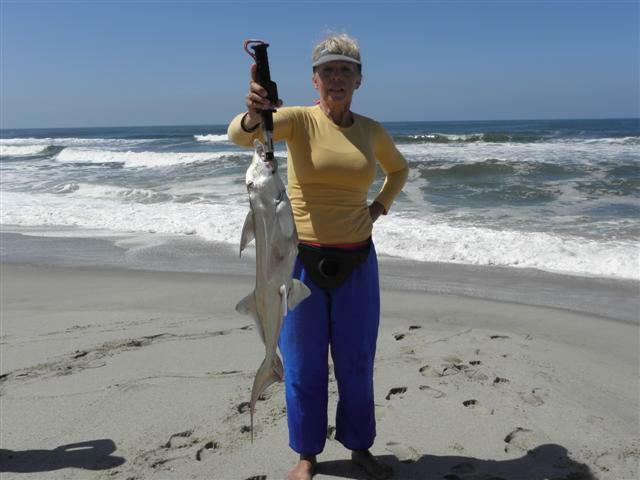 With all the guys from South Africa visiting Namibia I thought it a good idea to do an article on fishing the Namibian coast, between Swakopmund and as far as the gates leading to Torra bay. The information I am providing here is a guideline and can change at any given time. It must not be considered as cast in stone. When a time frame is mentioned it is an estimate as provided through experience and with input from local knowledge. Weather conditions play a major role in planning of events. Also when certain conditions are stated it does not mean for the entire time mentioned. Restrictions, regulations, regarding all topics mentioned may change. Photos used are mostly myself, wife, family and friends. 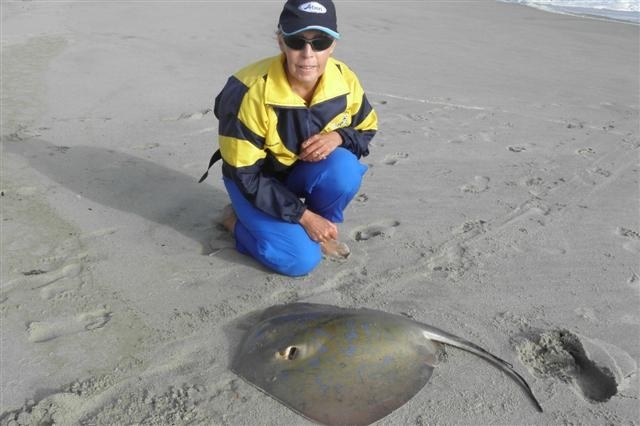 This article will mostly be covering the town of Hentiesbay as most anglers frequent this venue or either uses it as the supply base if they are camping along the coast. Links of existing information on Sealine can be used to broaden your knowledge. Also use the SEALINE SEARCH facility to gather more information. 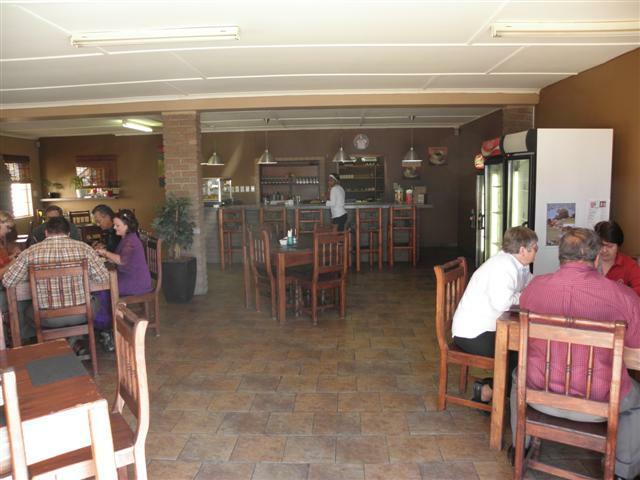 Hentiesbay offers all the commodities that any other town can offer. Being small in size and totally dependent on tourists for its income ensures that there is always that holiday feeling there. Grocery stores, garage, doctor, pharmacy, engineering workshop, clinic, estate agents, tackle shops, laundry, carwash, restaurants, freezing facilities, accommodation, guesthouses, bottle stores, banks, coffee shops, clothing shops, curio shops, bars, police/traffic services, etc, etc . 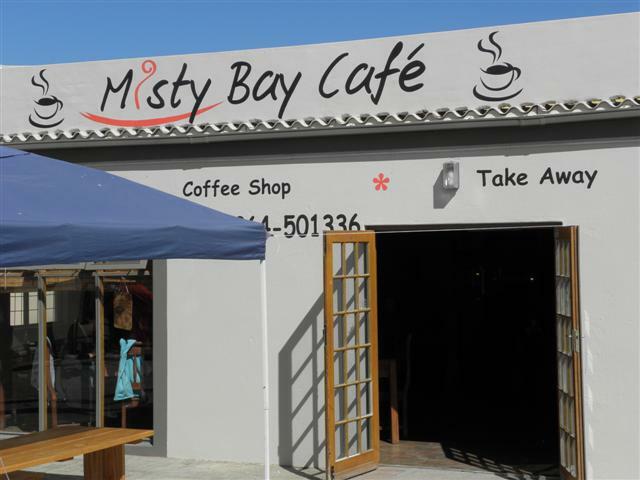 Visit the Misty Bay Cafe while here, not only will you get delicious and value for money food but Jaco and Annel will make you a lunchpack for the beach that is to die for. All that you need during your stay in Namibia will be found in Hentiesbay. What is a good time to visit Namibia? The answer here will have to be any time during the year. 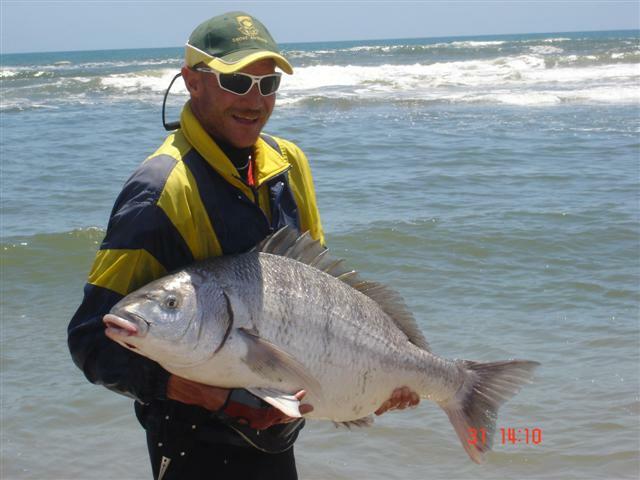 The Namibian coast always produces fish regardless of the time of year. 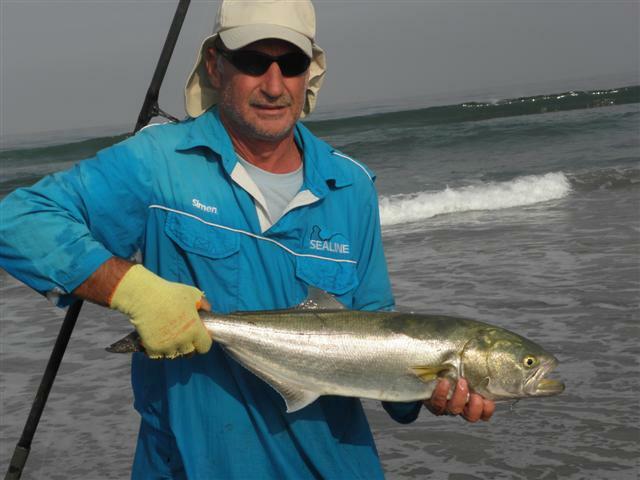 Cob, Steenbra, Galjoen, Blacktail are always caught and are always present throughout the year. There are however times which are just better than others. 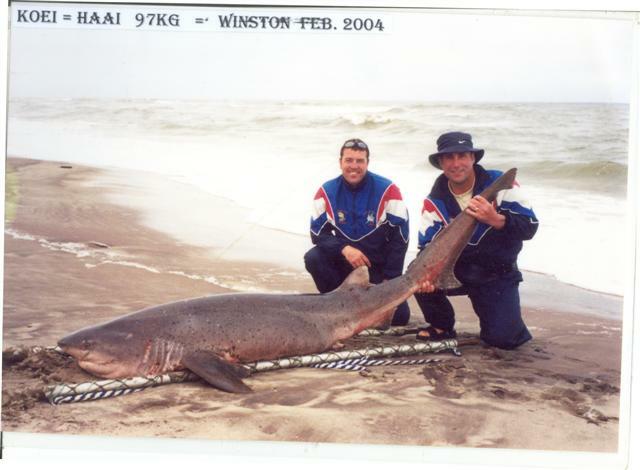 Spotted Gulley sharks are also found all year round, however Bronze Whalers leave the coast during certain times of the year. Also found Smooth hound sharks, Lesser sand shark, St Joseph shark, blue and Duckbill rays and even the odd Shad and Garrick are caught. Fishing is more dependent on the weather pattern than the actual time of the year. As stated fish are found along the entire coastline, however WATER READING is an important factor to your success. You may plan your trip with all the info supplied in mind, only to have bad weather (which is unpredictable) for the time you are here. Yes, as said, there are times which are better than others but overall there is no real dead time in which there are no fish present. Good / Well known angling spots. Use the link below or go to the forum section (by clicking on the Africa map – top left). Find the SALTWATER SECTION and click on Google Place Marks. Then click on Namibian coast. This will give you a complete map of the Namibian coast with all the GPS coordinates. Use this as basic info to get to good/well known areas. You will then just have to check that specific area for the best place to fish. Which month should I choose to visit Namibia? A good month providing the warmer water which came closer to shore during the second part of December has receded further offshore. The ideal water temperature will be between 14 and 16deg. In and around mid December the water starts heating up by offshore warmer water currents being pushed closer to shore by prevailing winds. The water temp can go as high as 20deg. Still good catches can be made but more selective searches will have to be made. What fish can be caught? 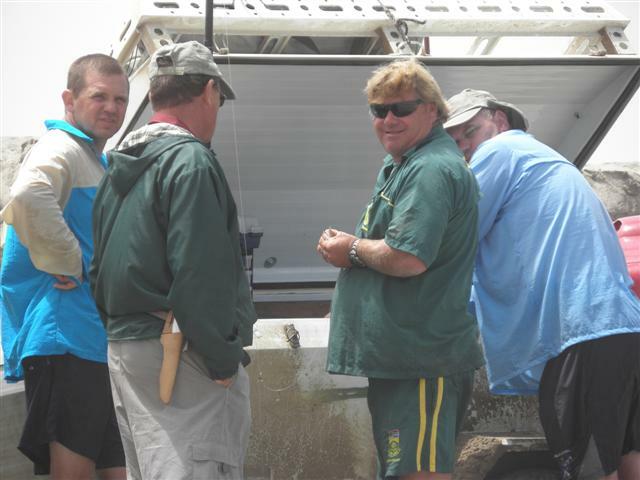 Cob, Steenbra, Galjoen, Blacktail, Spotted Gully sharks and Bonze Whalers. Very good/great months for angling. During these months all seems to come together to produce good results, water temp, winds, no cold fronts, raining in the interior areas. Also these months are the months for the big Steenbra to be present, not only in size but also in numbers. Steenbra then are caught all along the coast. These are also good fishing months but the following has to be taken in consideration. There must be no cold fronts in the Cape area which will move down Namibia way and make it bitterly cold here. The coast must not be having Easterly winds at this time. These cold fronts have a major impact on the fishing here, very big swells, strong washes, cold days, drives the fish to deeper calmer waters. 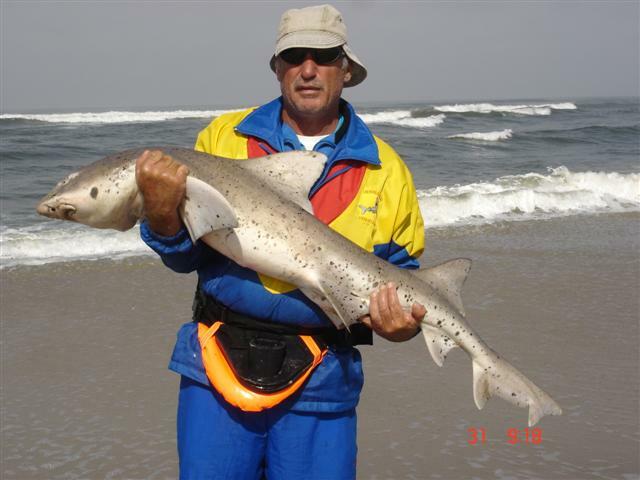 Cob, Steenbra, Galjoen, Blacktail andSpotted Gully sharks. Bronze Whalers are getting very few and far between during these months. 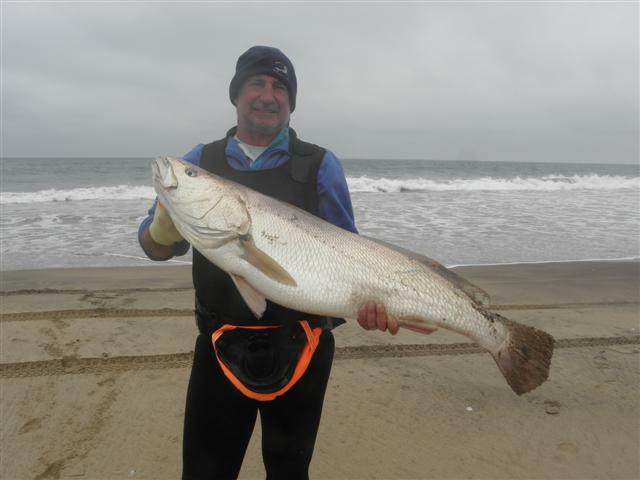 Good/moderate fishing month but prepare yourself for bitter cold and windy days on the beach. Real miserable fishing weather. Prevailing southerly winds are in the order of the day. Here you have to be a diehard fisherman to withstand the conditions. Cob, Steenbra, Galjoen, Blacktail and Spotted Gully sharks. Bronze Whalers nearly nonexistent during this month. October / November / December. Good / Great/ Excellent Months. The reason for classifying this as good / great/ excellent months is for the simple fact that the schools of big Cob generally migrate from North to South for the annual breeding season. These schools frequent different areas of the coastline we are discussing on their way to Sandvishawe South of Walvisbay. 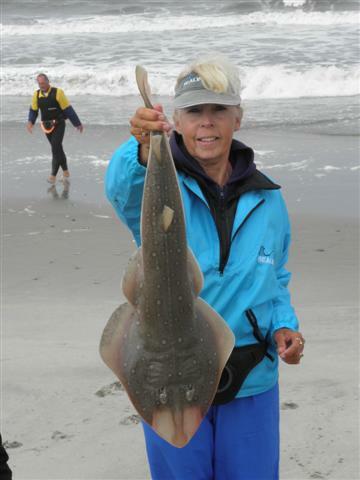 Big schools are often found close inshore and provide for that fishing dream to come true. What is considered as a good fishing time? I (one) week before full moon and 1 (one) week after full moon tends to be the best fishing time. There will be a springtide during this time and it must be remembered that for approx 2 days fishing might not be all that good. How must I plan according to tides? If possible try and have the low tide early in the morning. By having this allows you a full day of fishing as you will be fishing towards and through high tide and again the hours after high tide. This way you will be optimizing your hours for fishing. Enquire about the quality of bait available at the time you intent visiting. There are times during the year that the Namibian bait (especially sardine) is of a very poor quality. 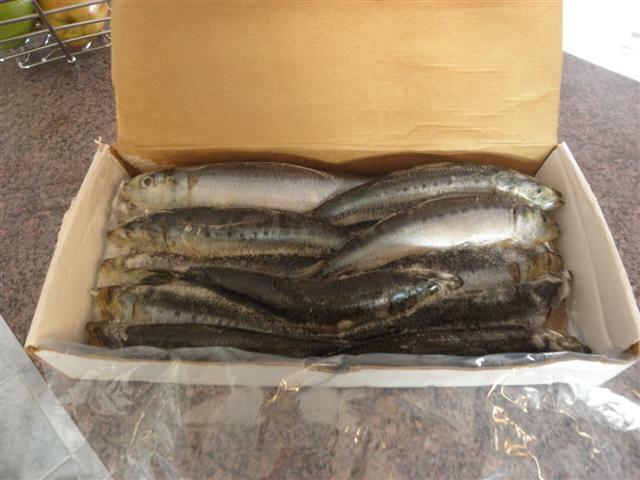 Sardine – Can be bought locally. 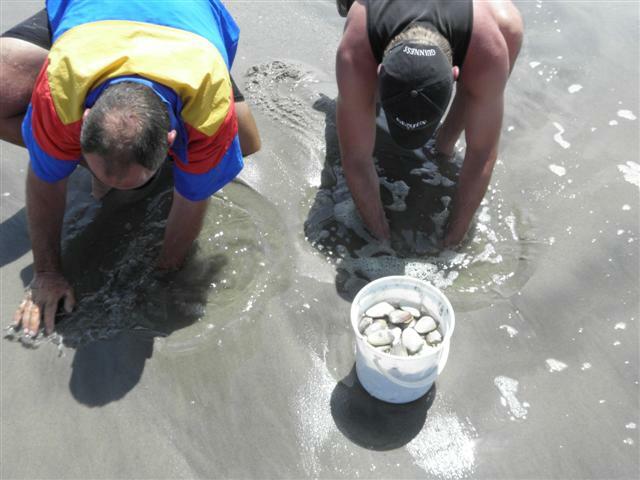 White mussel can be obtained locally. Crayfish – Although available in limited quantities rather bring your own. 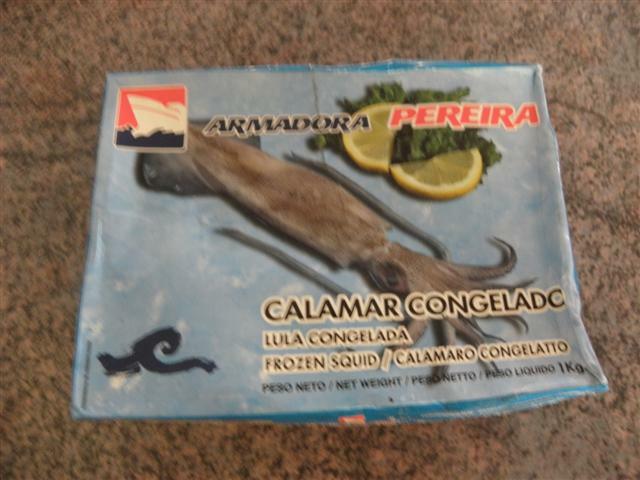 Chokka – Available in limited quantities (except the baby squid - edible type). 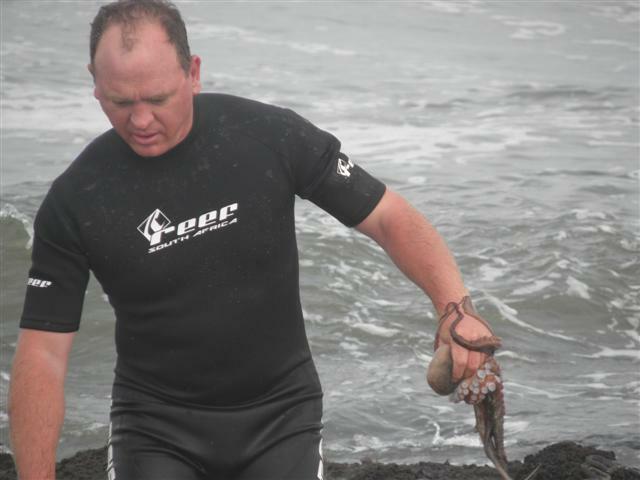 Octopuss – can be obtained locally. What baits to use for what fish? Cob, Steenbra and even Spotted Gulley sharks will take this bait. 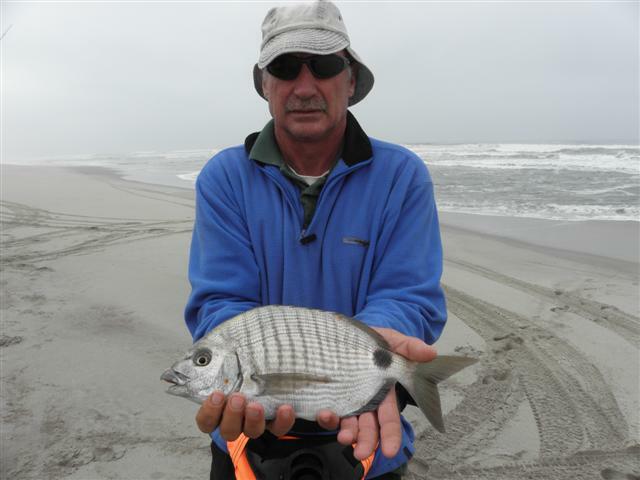 Cob, Steenbra, Galjoen and Blacktail are all caught on this very versatile bait. Cob, Steenbra, Blacktail and the odd Spotty takes this bait. Probably the best all round bait available. All species can be caught on this bait. Various combinations of the above mentioned baits can be made and used with success. Traces and rigs also differ from angler to angler. The link here is what is generally used. Search here and you will find numerous bait presentations. On tackle I cannot prescribe what you should have as tackle is a personal preference and differs from person to person. Your rods, reels, tackle should be in good working order as you intend fishing very hard for the time spent here. 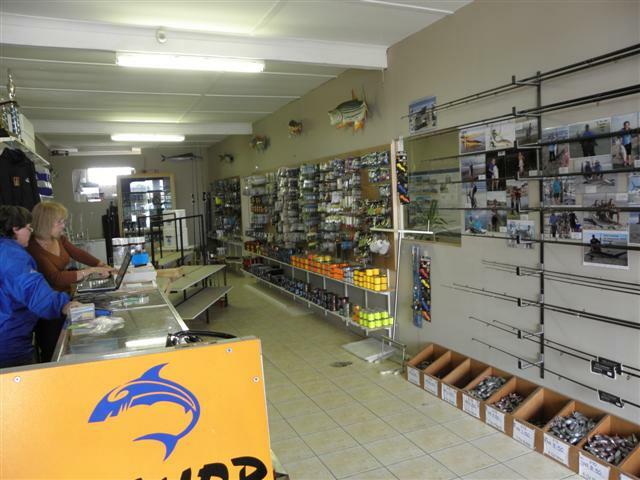 If there are any specific articles which you use when fishing, rather bring extra/spares along as, although we have good tackle shops here, we cannot compare to the well stocked SA shops. Can be done for edibles and sharks -- personal preference. Always great, mullet are available just be on the lookout for them. Use a very small hook and a piece of sardine as bait. Can be done, pick your spot with crystal clear water though; otherwise you will be only catching Babel. To explain this is very difficult, but as a rule of thumb don’t fish quiet waters where no waves or rolls are present. Find water where waves are sequential and running towards you for finding Cob. Steenbra likes white foamy working water and gulleys. 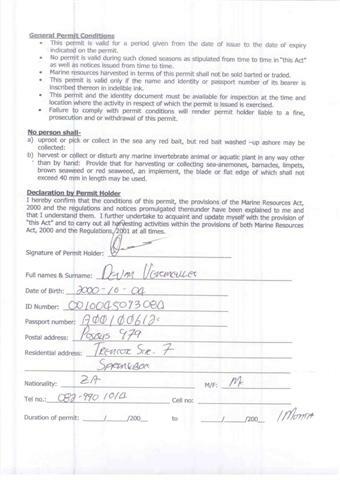 Fish are not allowed to be cleaned at houses in Hentiesbay. There is however places that you can clean or have fish cleaned in close by. Cleaning your fish yourself still stays the most economical and rather do it on the beach. Make sure you carry your litter home with you. You can discard it at the SKUBBEBAR (cleaning area). Do not leave Babel barbs lying on the beach, take them home and discard them. Usually anglers only start doing this once they have stepped into a barb themselves and experience the pain and discomfort of this injury. 40 cm and not more than 10 per permit holder per day and of which only 2 may be bigger than 70cm. 40 cm and not more than 10 per permit holder per day and of which only 2 may be bigger than 65 cm. 30 cm and not more than 10 per permit holder per day. 25 cm and not more than 10 per permit holder per day. All fish sizes include the head and tail and under no circumstances may you have fish fillets in your possession. I suggest if it’s your first time visiting that you spend the couple of extra Rands and make use of a guide for a day or two. This will help you to get to know the area very quickly and also for what type of water conditions to be on the lookout for. You could have the guide physically take you fishing or ask him to move you along the coast at a higher rate so that you can familiarize yourself with the area. Spyker during one of our fishing trips. Renier guiding a group (BrianA) of Sealiners on their trip. 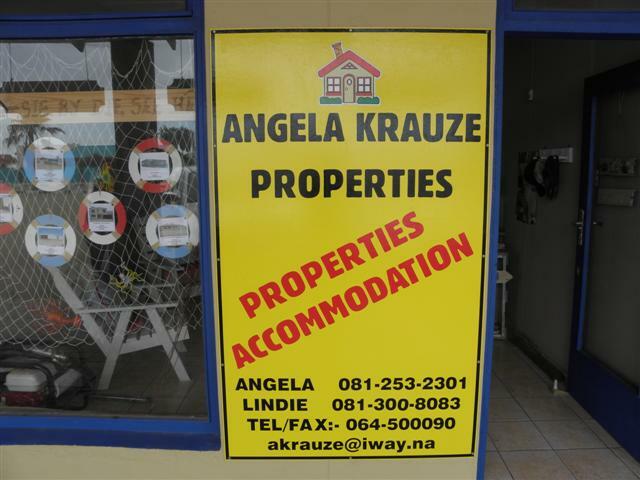 Various forms of accommodation are available, from guesthouses, self catering accommodation to camping facilities. 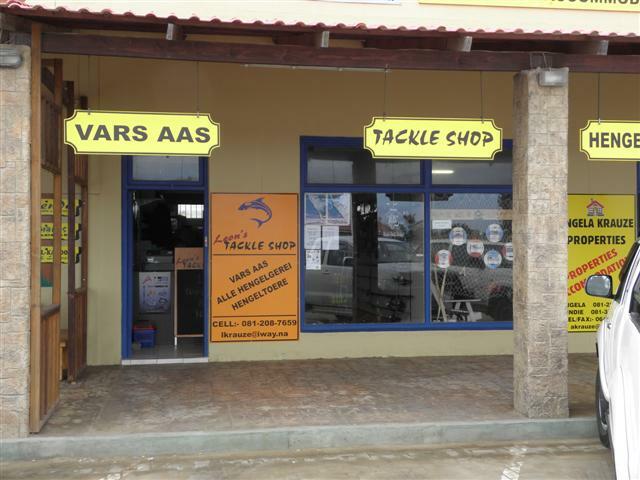 Fully stocked tackle dealers are available locally. Make sure of the current import rules that apply when you envisage visiting Namibia, there are certain times during the year when meat for example is not allowed to be imported or exported. Be sure of the quantities and sizes on the permit. Keep your BAIT SLIPS when entering the country, you could be asked for it. 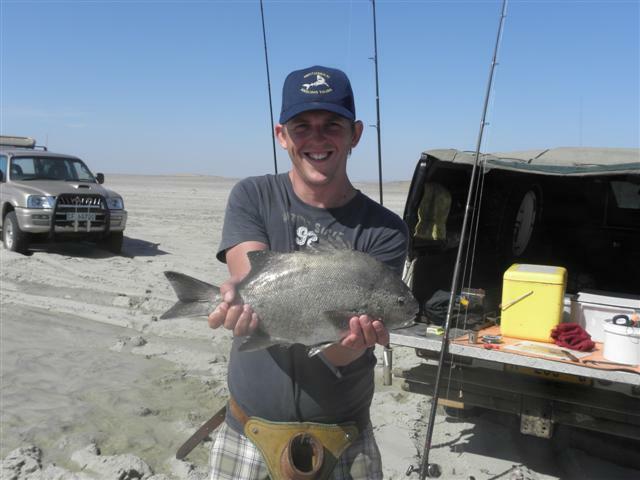 There are no dangerous fish along the Namibian coast, meaning we have no fish that will attack and intently cause you bodily harm. 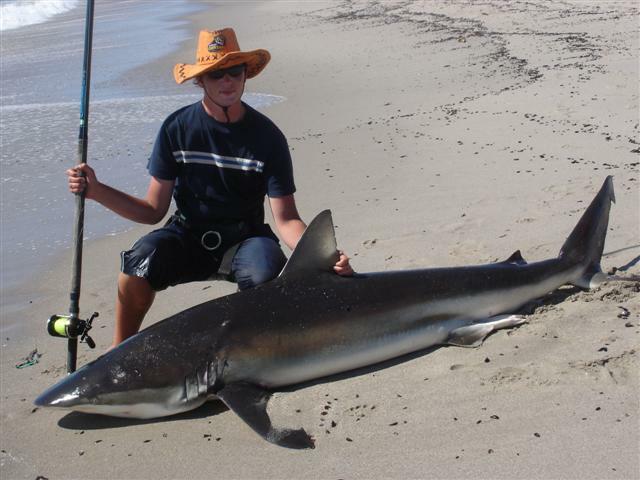 The sharks we have, Bronze Whaler, Spotted Gully shark, Smooth hound and Cow shark are not known to attack people. No records could be found of any shark attacks. 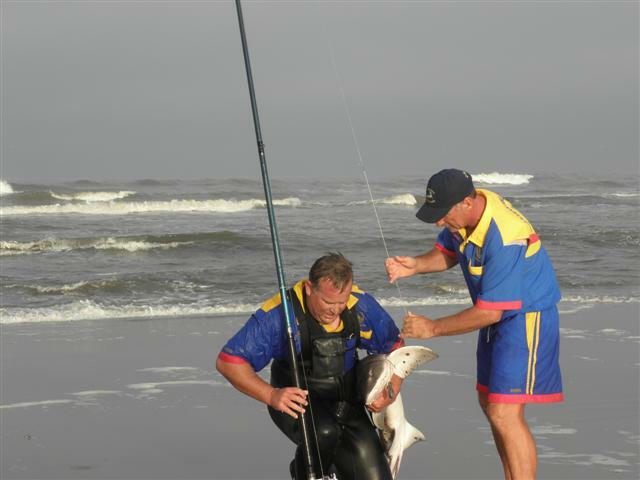 Saying that we don’t have any sharks known to attack people, care should be taken when handling them, there have been numerous cases of people being bitten by sharks when handling them during the landing or return process while fishing. Special care should be taken when handling Babel and rays as they could inflict painful wounds with their barbs. The best remedy is actually water a hot as possible, place the wound in the water and hold for a while. The hot water neutralizes the poison. Now hot water is not always available where you are fishing. Carry a bottle of meat tenderizer with you in your tackle box, should you get stung by one of these, press the wound so it bleeds and apply the spice generously over the wound. The tenderizer draws the poison out of the wound. Doctor and Pharmacist available in Hentiesbay. If you are a big water drinker I suggest you buy mineral water or mix mineral water 50/50 with local water. There is nothing wrong with Namibian water, only it takes some time for your stomach to get used to it. Not being used to it and consumed in large quantities may leave you with a loose stomach for a day or two. Use sun block, wear a hat, and cover yourself even on overcast days. The sun is unforgiving and don’t spoil your holiday by burning to such an extent that you can hardly move. Take special care of your FEET. You will be barefoot on the beach daily, don’t let the sun burn your feet so badly that you can’t walk. Don’t have illegal bait in your passion. DO NOT try and bribe any official. Always have your fishing permit with you. Be careful of areas that you enter that the tide does not block you. There are a lot more, but basically what I am saying is just stick to the rules and your trip will be very enjoyable. A valid passport (should be further than 6 months from expiry date). Vehicle papers (vehicle, trailer, caravan etc). If your vehicle is on HP at a bank get a certified copy of the papers and a letter from them authorising you use the vehicle outside the country borders. A sticker on the right rear of all vehicles (ZA). 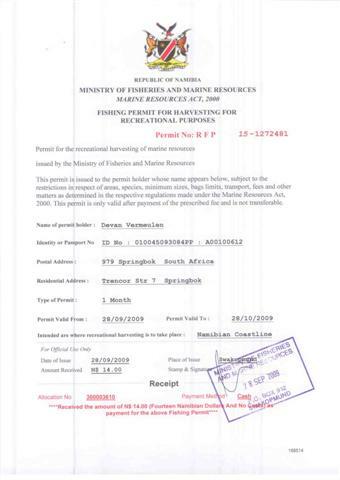 Import permit should you be taking fish back to SA. You don’t always get asked for all this but its better having it than being without it. In general Namibia is a very safe country where armed robbery, murder, hi jacking is basically nonexistent. Care should be taken in towns as petty theft increases rapidly during the holiday season. Petty burglars tend to target tourists and will break into cars, houses, flats etc and steal valuables, like phones, cameras, wallets, reels etc. Bodily harm is very seldom caused to any person during a robbery. They target tourists for the simple reason that they know if caught (and they will be) that no tourist will go to the trouble of returning to Nam to attend a court case regarding a cell phone. Most places of accommodation have either alarms, security guard etc. Familiarise yourself with these procedures and make use of them. The local currency is the Namibian Dollar which has the same value as the South African Rand. You don’t have to exchange currency from Rand to Nam Dollar as the S.A rand is accepted throughout Namibia. Normal credit/debit cards are accepted throughout Namibia and ATM machines are found everywhere. Make sure when returning to SA that you don’t have Nam Dollars you have to exchange for to SA. Rands. SA. does not accept Nam Dollars (have to exchange at bank) in shops. Should you have too many Namibian Dollars with you before you leave, visit one of the local banks in Namibia or large shops and they will gladly exchange the Dollars to Rands. 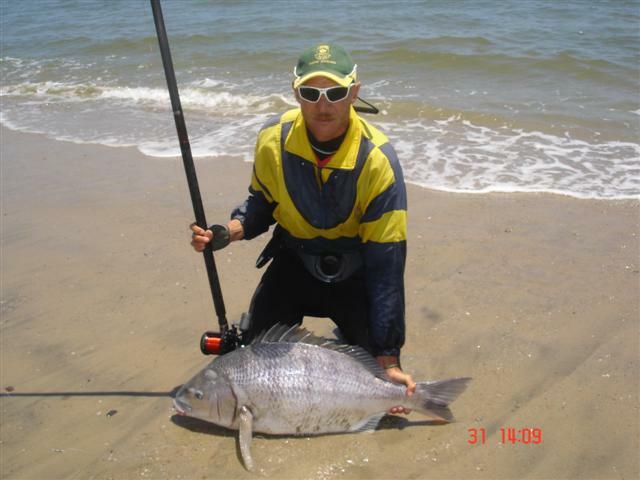 Namibia still is one of the best fishing destinations for Rock and Surf anglers. Being closely linked to South Africa and much being a mini South Africa it is still a value for money destination. People are friendly and do not mind helping and sharing information. Many a angler has ventured this way and many mixed results are recorded of their trips. For some their dreams came true, for others the second trip is in the making. Others have been returning year after year. No matter how good you plan, no matter how many suggestions and facts you take in consideration, your time here may be overturned by a spell of bad weather. Bad weather is also not the norm of the day, and even in these conditions fish can be caught by guys willing to put in the effort. There are few places left on the African continent which is close and affordable. Namibia is one of them. I hope this article answers some of your questions. Feel free to contact me on the forum. Thanks, that was brilliant ...do you know how far north one has to go to get into tarpon country? my information would indicate that tarpon only come as far south as angola ...but angola is not as easy to travel as Nam. FANTASTIC Simen what more could we expect from the HENTIES Professor. That will be a great help to the guys thinking of going. Baie goed gedaan Simen. Dit verdien mana ! Simen very good post . You mentioned " No worm bait of any kind allowed to be used in Namibia. " May want to ad that nobody may even be in possession of any worm . Not even the dried worms from Australia. That is sold in South Africa. I checked with the officials a few weeks ago in Walvis . Was warned by the officer. That they will not allow any of the dried worms or even earth worms . FRITZABU wrote: Simen very good post . !00% right, no worms of any kind, fresh, dried, imported, nothing. Only worm legal is plastic. Thanks Cousin, this is just what everyone was waiting for. Thanks for all the hard work. Wow - magic stuff Prof Simen. Wanneer word die boek vrygestel Simen ? Jitte ek het nou 'n lekker stout wees kamera ! Die' sommer van die skerm af afgeneem. Die sandhaai is enige tyd so groot soos die kabeljou ! I cant seem to find the angling risriction on the no. Of rods allowed to be used at a time, can you please help? Thanks for the great article,information and photos ! fantastic Namibian coast and event ! I know that everybody says only one rod at a time but I cant seem to find the regulation in any of the papers I have read, has any body ever checked up on this rule? Oom Simen, very nice post, are one allowed to use bait such as chicken livers?